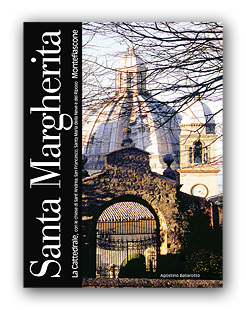 The history of the cathedral of Santa Margherita of Montefiascone (VT) that with its dome it dominates the town of the tall Lazio you/he/she is told with texts and images by priest and custodian Don Agostino Ballarotto. This work wants to be the synthesis of all of this that has already been writing and, above all he/she wants to be a guide to the most prestigious monument of Montefiascone. The book composed by 80 pages more cover in the format 21×29,7 cm in paper varnished shiny and embellished by the shiny plastificazione in cover. One of the most beautiful and interesting publications concerning the famous cathedral planned by the architect Donato Bramante and then built in the XIV century. Our administration thanks the priest Don Agostino Ballarotto.